All living entities are bound to be protected by humans from slaughter and unethical practices that could harm them. The supreme Lord Sriman Narayana resides inside each and every living and non-living entity as super soul (Paramaatmaa in Antaryami from), and our basic nature is to be compassionate to each and every entity. Indulging in violence and slaughtering of animals by exhibiting rajasic and tamasic qualities accounts to gross murder. And among these animals, cows occupy a special and significant position, as she is one among our seven mothers : ones birth mother, the nurse, the wife of a brahmana, the wife of the king, the wife of the guru master, the earth and the cow. Ones own mother gives milk to her child for a short period of time and its the Cow that gives her milk through the life, without expecting any benefit. Cow products such a milk, curd, butter and panchakavya contribute to the health, agriculture, medicine and the country’s overall wealth. Everything about a cow is holy and auspicious. Gomatha plays a central role in Vedic activities. To protect our eco-system and lead an auspicious life, spiritual practices such Yagya, Homas are must. And the base to perform these yagya/hoomas are from the byproducts of Cow, such as Ghee, cow dung etc.! The welfare of the universe depends on performing the rituals as prescribed in our sastras and mother cow plays an indispensable role in fulfilling this duty. Especially in the age of Kali yuga, where darkness prevails predominantly, cow protecting is a must act to establish peace and prosperity across the globe. It is not only our duty to protect the cows (the mother) but also the bulls (the father), as he assists in plowing the earth for agriculture purpose, so as to produce the food that we eat. Mother cow is the place where all the Gods, Devatas and Punya theerthas reside. It is one of the 5 places where Goddess lakshmi resides. In viswaroopa darshan in every temple, in the morning, a cow and her calf enters the temple and are placed in front of the deity to view the rear side of the cow first ( where Goddess Lakshmi resides) before anybody else is allowed for darshan. 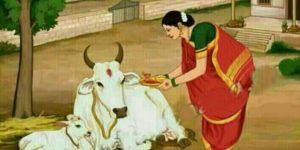 A cow is holy in each and every aspect, its not a favour that we do by protecting the cows, but its our bound duty and responsibility to protect them from slaughter and ill treatment.